Out-of-Print Ltd. Ed. 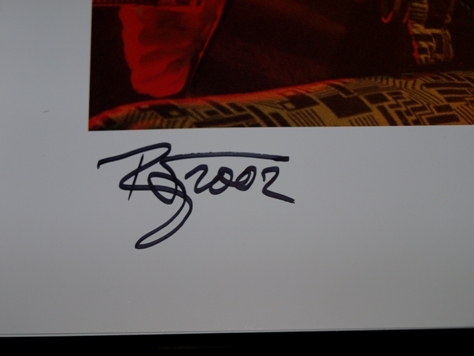 signed &amp; numbered UK Hardcover book: Genesis Pub. 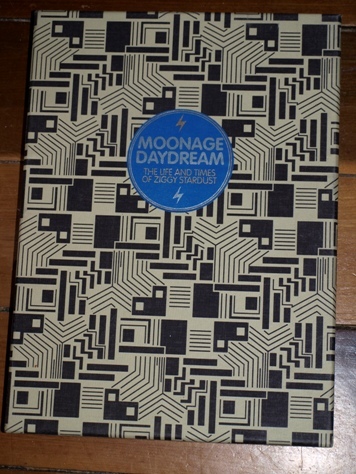 MOONAGE DAYDREAM is #736 of ONLY 2,500 copies. The HUGE (11x15) 350pg. book is printed on Art paper, with 2 different Color silkscreens of Bowie in Gold &amp; Silver foil on front &amp; back Book covers &amp; housed in a cloth Art-deco patterned hard Slipcase outer Box. With 660 photos, 315 in Color &amp; MANY rare &amp; UN-published shots from Mick Rock’s personal Bowie archive; spanning the ZIGGY STARDUST era: 1972-73. An absolutely STUNNING Book, it also includes a personally written &amp; very revealing 15,000 word Text by Bowie; detailing his personal concept of Ziggy. 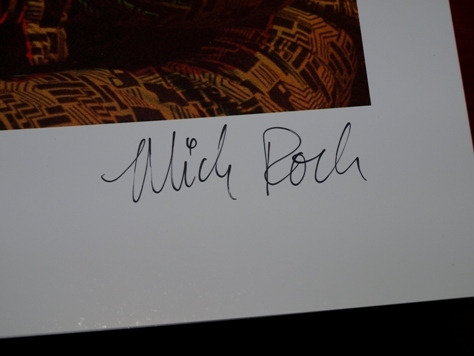 Book is Signed by BOTH Mick Rock &amp; BOWIE and is in the finest condition: a “Gift-quality” presentation copy. 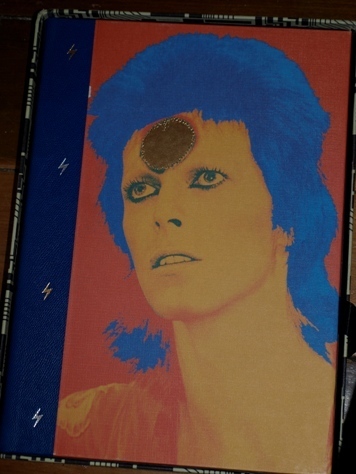 For the serious BOWIE fan/collector, this is the ONLY edition of this Book to have! All the smaller &amp; cropped-pages, cheap Paperback copy reissues pale into insignificance along side this visually STUNNING &amp; Out-of-Print Ltd. Ed. BIG (11x15) &amp; HEAVY (10-12 lbs) Book . LITTLE WONDER CD 2 LIMITED EDITION Digipak UK. SOLD! REAL COOL WORLD Digipak US. 6 diff.version of RCWorld. SOLD! STRANGERS WHEN WE MEET UK edition SOLD! 1.Strangers When We Meet(edit) 2.The Man Who Sold The World(live version) 3.Strangers When We Meet(LP Version) 4.Get Real. SEVEN YEARS IN TIBET Digipak. Made in EU. SOLD! 1.Seven Years In Tibet(edit) 2.Seven Years In Tibet(Mandarin Version) 3.Pallas Athena. JUMP THEY SAY Digipak UK edition. SOLD! 1.Jump They Say(album version) 2.Jump They Say(radio edit) 3.Jump They Say(ClubHartRemix) 4.Jump They Say(LeftfieldRemix) 5.Pallas Athena(album version) 6.Pallas Athena(DontStopPrayingRemix). TELLING LIES UK. 3 diff. versions of Telling Lies. Mint Condition. SOLD! I CANT READ / This Is Not America CD-SINGLE Made in Germany. SOLD! Features the Bowie Track Taken from the Ice Storm Original Soundtrack. Also features the Bowie/Pat Metheny Group Colaboration Track This is Not America. IM AFRAID OF AMERICAN USA. 6 diff. versions of Im Afraid of Americans. SOUND & VISION. DAVID BOWIE US 808 STATE Canada. 4 diff. versions of S&Vision. Mint Condition. SOLD! TSANTANA//JJ CALE//IGGY POP//GLORIA GAYNOR//LEON HAYWOOD//THE BUGGLES//PATRICK JUVET//KENNY ROGERS//ROGER WHITTAKER//BILL MEDLEY//DAVID BOWIE: The Laughing Gnome. 8 different HUGE Promo Lobby Cards. Measures: 26 x 35 cm. (approx. 10x 14 inch) Bigger than UK lobby cards. EARTLING IN THE CITY 1997 Promo CD from GQ magazine. Made in USA. THE 1972 AMERICAN TOUR (PRCD 1038) Live at Santa Monica Civil Auditorium. 29 Oct. 1972. Made in Italy. Good Condition. Price U$S SOLD! RARE TRAX VOL.1 UNRELEASED MATERIAL & COLLECTOR'S ITEMS. Promo CD from Rolling Stone magazine. USA Includes Telling Lies (Feelgood Mix). Price U$S 5 SOLD! PLAY ALONG TO THE FULL BACKING TRACK: ZIGGY STARDUST. CD Vol.5 from UK Total Guitar magazine. 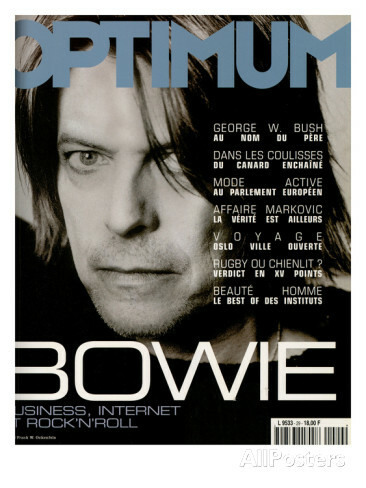 Ziggy on cover Price: U$S 7 SOLD! Comics Editorial. Good Condition. Price U$S SOLD! QUEEN & DAVID BOWIE - UNDER PRESSURE SOLD! BLUE JEAN - 7 INCH USA EDITION - 1984 SOLD! Loving The Alien - PICTURE DISC SOLD! THE HEARTS FILTHY LESSON - PICTURE DISC NEW!!! UK, USA, Argentina, Italy, Japan, France, Germany, Spain, etc. -DAVID BOWIE - BOWIE THE BEST CD + DVD. SOLD! -COOL WORLD MOVIE SOUNDTRACK SOLD! Bowie, Moby, The Cult, Thompson Twins, etc.